Late last week I was sitting at home taking care of three dogs, helping concierge clients, and realizing that my wife wouldn’t be back home for a week. I looked at my calendar to see what this week held, and sure enough, it was pretty light. I decided to come visit Delta in Atlanta. Yep, that’s Delta’s Ship 41, the first DC-3 that carried Delta passengers. It was painstakingly restored and now sits in the Delta Museum, which is located in the airline’s original Atlanta hangars. It is only open for employee visits once a month, but Curator Tiffany Meng kindly opened it for me to take a look. I also had the pleasure of finally meeting Archives Manager Marie Force. I could have spent a week in the archives easily. I met with the head of reservations about the new @DeltaAssist effort, and I ended the day with Glen Hauenstein, CMO and EVP Network Planning, Revenue Management and Marketing. I shouldn’t say the day ended there, because we had some good ole’ Southern food afterwards. My arteries are not happy. They even flew me out in the front of the bus, which was certainly unnecessary. I ended up on the 777 on the way out with the herringbone seats, and I’m riding a 757 home. As you can tell, there’s a lot to share with you after this visit. Overall, I found the trip to be a good (if very basic) look inside the Delta culture. Seeing a corporate communications group that’s so willing to open up and talk with a blogger individually is rare, but it’s especially surprising when it comes from a legacy carrier. While I don’t agree with everything Delta has done, I found a very driven group of people that had really already considered every question I asked. They aren’t just sitting still. Sometimes they didn’t know the answer, but other times they just hadn’t been able to implement things yet because they’re trying to do so much. Sorry I don’t have more to report today, but there’s a lot of digesting left to do. I’ll start writing and posting on this tomorrow. It may take me awhile to get through it all, so please be patient. Who paid for the airfare to Atlanta? And who paid for the lodging? Just curious for full disclosure. Not at all accusing you of bias, I love the site, but still an important question. Seeing the DC3 would have been exciting, but if the museum is only open once a month for employees, what does the Curator do the rest of the month? They only open up the interior of the DC-3 once a month for tours. The museum itself is open to the public M-Th, with occasional open days on Saturday. Thanks DGS, now it makes sense. The limited hours for the DC-3 are due to all the historical preservation precautions (see Dave’s commend below). Ship 102 (the original Spirit of Delta 767-200) has been converted into a mini-museum and is open for a couple of hours two days a week. The rest of the hangar spaces have static displays that have gotten more detailed in recent years. The gift shop is the forward section of the prototype L-1011, which was converted into a pull-apart movie set by Delta mechanics in the 80s. You can get some old promotional stuff from Delta, Western, Pan Am, etc., as well as a copy of just about every copy of the Delta Digest employee magazine ever printed. I’m very jealous, Brett! Sounds like you had a great time and got a unique look into DL’s operations. This airplane nerd is certainly envious! 777 from LA Area to ATL? Gotta love flying the international metal around domestically. They run the 777s and 77Ls domestically from DTW as well. It’s the 77L from SYD making a stop at LAX and continuing to ATL. Yes, and then it went on from Atlanta to Dubai. Gotta move that plane around to get to Sydney, and there just aren’t that many in the fleet. Sounds like a fascinating visit. Cannot wait to hear more. The DL Corp Comm team rocks! From a hub airport’s perspective, it’s 180 degrees from working with (or all too often against) NWA. Looks like a fantastic opportunity for an inside look at a large airline’s operations. I’m looking forward to reading more, and learning. Brett, sounds like a ball! I had a similar experience with AAL, and ironically, with a very similar DC-3 at the C.R. Smith museum. Lots of fun, and beyond informative. I still don’t agree with AAL’s 1980’ish corporate styling and comfort, but its not the worst. And Brian? I’m officially dubbing you the CrankyFlyer “wet blanket” of the year. @MrSkyGuy. Brian’s question was very appropriate!. Full disclosure is needed always, due to the informative nature of this site! Your comment was unfair. I’d rather see people swim for themselves. The full disclosure was included in the entry. @Jordan like it or not, my comment was perfectly fair. Unfortunately Brian has a reputation for looking for “threads to pull” in the hopes that the “sweater will unravel.”. It’s getting old. They have finally initiated coverage on the weekends. I agree it doesn’t make sense to not be available 24/7, but they will get there. I’ll be writing about that in my discussion with the head of reservations. 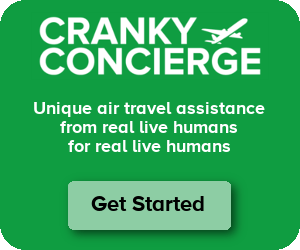 I am pleased to see Cranky has a good communications channel with Delta. Perhaps he can use it for helpful comments for DELTA improvements. I wonder how long the Delta personnel would be so public/consumer friendly if they interfaced more with the flying public (customers)? OR- Perhaps Delta can use the PR people to better train the workers in the trenches regarding attitude adjustment and REAL Customer Service. AND they can start in Atlanta, THE HUB FROM HELL! Sounds like a good trip. It’s nice to get to see what goes on behind the curtain. I’m sure your upcoming posts will be helpful for the rest of us. Got the chance to fly NC28341 SHip 41 when it was in BOS in 2004. She is quite the lady. Everything is like it was back then including the magazines in the seatbacks even though they are under plastic protections. Had to wear protection on our shoes and hand covers while in the cabin. I still miss the props and the startup bursts of smoke just as the engine caught. Have some pictures if interested. And it still is the same. I had to put on my booties and gloves to get on. The seats are all wrapped in plastic and there is a Life magazine from the day the aircraft was delivered in each seat back pocket. They have one of the mags out for inspection. It’s really impressive, and hopefully one day it will fly again. A few times a year a DC3 and an old World War II bomber comes around and you can pay for rides around the bay area. The cost is hundreds of dollars so not anything I would do, but the WWII always gets a lot of old guys who flew in them during the war. It’s nice to see old places like those kept in flying condition and even if the cost is high, they do give people a chance to fly in them to see what flying ‘used’ to be like. I’m probably going back 20 years now, but Cape Air used to fly DC3’s from LaGuardia to Nantucket. One of my most memorable flights ever. Much better than the Concorde, as a matter of fact. Tiffany and Marie have done an amazing job organizing the Delta Museum and the archives. They really have set the stand for the industry. You didn’t mention the Spirit of Delta–that had a special spot for an old widgethead like me. Brian, you’re an old widgethead?! Heresy! Where’s the LUV? Mark, the LUV is right here at my job ffor the last 15 years but I did spend 18 1/2 years wearing the widget. I’ve never hidden my Delta past, at the time I worked for them it was a great training ground for customer service, and I got to do almost anything you can do at an airport, ramp, ops, counter, gates, baggage service, cabin service, cargo, ramp tower, even oiled engines and rode brakes in the cockpit on moves to remote parking. Brian, I hear you. Sounds like you had some fun at DAL.. back when the airline was turning L10s, 72s, and 732s! But I’m torn.. the new Delta and the old Delta couldn’t be more different. My gut tells me the combined NW & DL is ready to really excel on the network & services front (once they fix the IT/web mess), but what’s going to hold them back is a crappy loyalty program and AMEX holding so much influence. I look forward to hearing Cranky’s take on that. I’m not so sure about the Amex piece, but SkyMiles could be an issue. I definitely got into a lot of this with Jeff Robertson, VP of SkyMiles, but it’s going to take some time for me to get it all together. Look for it after next week’s vacation. John, Cape Air never flew DC-3’s. They only flew Cessna 402’s except for 2 ATR’s they fly out from Guam. You sure it wasn’t Air New England or PBA? Love your postings on Delta. I can’t wait for you to complete the postings involving your visit with Delta. My particular interest would be the visits you had with the reservation and the online marketing people. No other airline blog does this kind of thing. Have a good vacation.